Someone pointed out recently that we haven’t been showing what we’re doing right at this moment. (Sorry about that, there is so much past work to show, it’s hard to squeeze it all in.) Well, Bill’s next post will unveil the biggest recent project and we’ll walk through each day of renovation in fairly real time so that you can see how long it takes us to finish a project. In the meantime, I wanted to show you what we’ve just completed — the upstairs bath. There are only two bathrooms in the entire house, and the one upstairs is the only full bath. When we moved in, the tub was actually brown with grime. Thankfully, my sweet husband scoured it for me. The dark green wallpaper was peeling from everywhere and the ceiling had also been wallpapered to hide cracks (also peeling). The woodwork was dry, and the closet unmentionable. So, we got to work. We started the bathroom renovation almost immediately when we moved in last July. However, we couldn’t do much at that time as we were waiting for the full purchase to go through. So, we removed the urine stained carpet in the closet and put 3 coats of paint on the closet walls to cover the dark green. It was enough for the time. 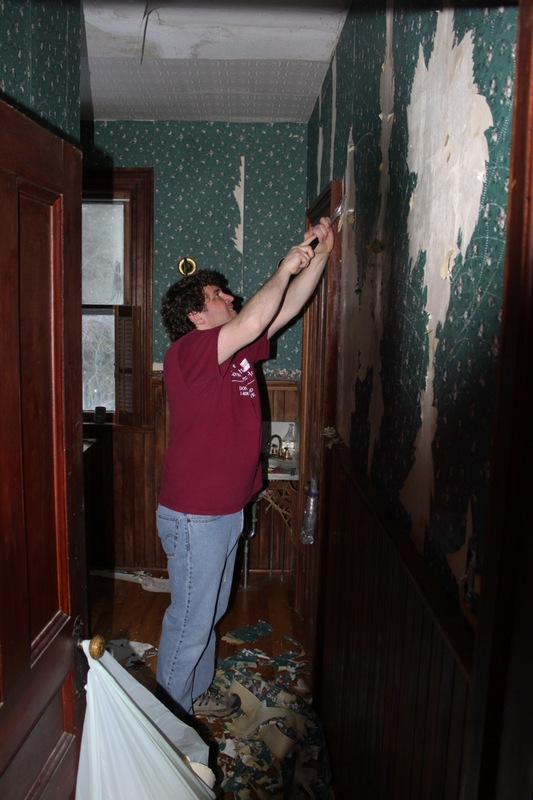 Once this spring rolled around, we got to work on the main part, removing wallpaper. It took us weeks to remove the paper, considering it had been put on bare plaster and bare sheet-rock in some places. Nothing takes it off when it is glued directly to sheet-rock. The only thing one can do is cover it, so we did. Bill, the everlasting plaster machine, loaded on 6 layers of plaster to cover wallpaper, cracks and divets in the walls. Then, I was able to prime and paint and stencil. We both restored the woodwork with our new favorite treatment, Danish oil. To round out our work, I repainted the light fixtures and sink brackets in hammered copper. If you notice in the top photo, the marble sink has two brackets underneath holding it up, or pretending to hold it up. 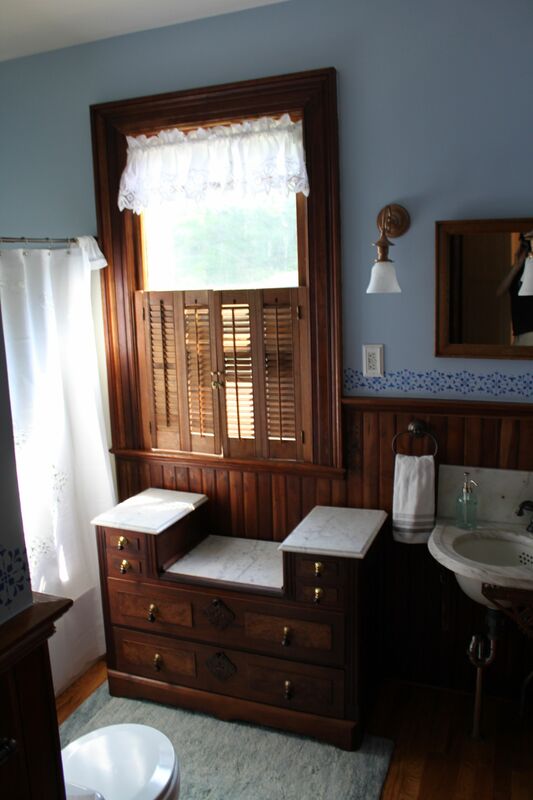 Our greatest treasure was finding an old marble topped vanity (matching the sink marble) to use as a counter and storage. The bathroom is oddly shaped, but big enough to hold a small dresser. To top off the new look, we got new sink hardware in oil rubbed bronze. Course, there was no way I wanted to change the sink. 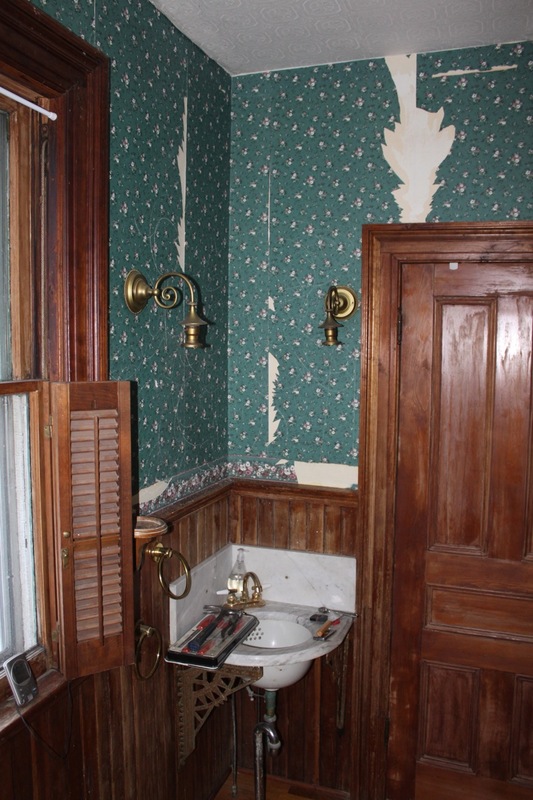 We think it is original, a small corner marble sink–couldn’t be more quaint. Bill topped off the room by giving the floor a coat of polyurethane, and we called it done. Really, this is the first room in the house that is fully complete~ floors, hardware, linens, everything. I love the wainscoating in the bath!